Many travelers have known the capital of Raja Ampat Regency, which is Waisai City. Due to its fame and good landscape, it becomes tourists’ destination as well. One of the best spots is Cemara Beach! Cemara means “Pine Tree”, but there is no pine at all near to that area. What people can enjoy is the purity and soothing atmosphere of the beach, where tourists can relax and do many fun activities. 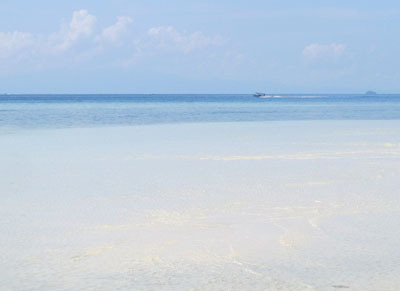 Cemara also becomes one of the best coastal areas in Waisai, including Saleo and Waisai Beach. Thus, it is worth a visit. There is one-word representing Cemara Beach, which is “purity”. Once tourists get to the beach, they can only find flawless sea scenery and feel rejuvenating air! The sand is pure white and soft. The water is crystal clear and calm. Not to mention there is a formation of hills in the horizon, which is quite majestic! As if, the God has provided that coast to people, so they can feel a little bit sensation of heaven. Even the sky shows a small number of clouds. Beach walking is the most common thing to do in Cemara Beach. Tourists can feel the soft texture of the sand and hear the calm sound of the waves while walking. They can also see the beautiful movements of coconut trees’ leaves nearby. Somehow, all of these features give a peaceful feeling to any visitors. By beach walking, they can find peace and eradicate all stresses of their life. Despite the secluded location, the beach has is worth an exploration and it becomes a perfect spot for relaxation. It’s is like a maiden, which is unspoiled and stunning. Most of the tourists come to Cemara Beach for spending a serene night, as well. That means they would rent a room in a nearby resort and experience the nautical nuance. After all, several resorts are available there with their excellent amenities. The design is similar to a traditional house of Jambi. They also feature several leaves and other traditional materials, which are quite beautiful! Not to mention the services are great. Another interesting activity is photography. Tourists can take numerous beautiful objects, which are scattered there. Taking selfies is also a good idea, involving the sea as the background. Simply put, all parts of the beach are worth a photo shoot! At the end of the vacation in Cemara Beach, tourists should try visiting nearby vacation spots, which are also worth an exploration. Despite the tiring and time-consuming efforts, it gives them irreplaceable experiences for sure. A trip to Cemara Beach takes much time and involves several checkpoints. For those coming from Jakarta, the first destination is Waisai City. That means travelers need to take an airplane to Marinda Airport. Next, they need to take a local transportation service to the last destination, which is Cemara Beach. It is located in South Waigeo District.